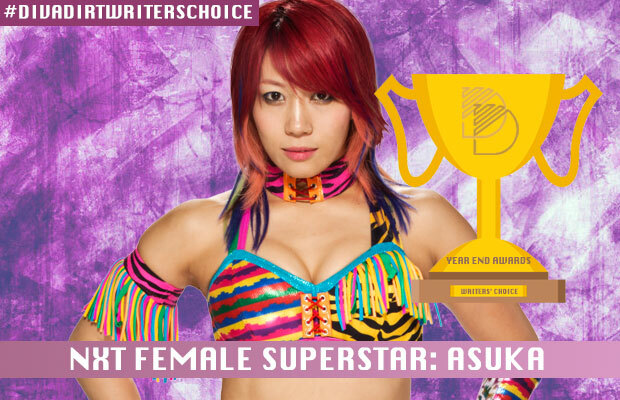 Diva Dirt presents its sixth annual Writers’ Choice Awards, as decided by the Diva Dirt team. As we come to the end of 2016, we have picked the best of the best to be awarded our Writers’ Choice trophies. No one cemented their status in NXT this year more than Asuka. An enigmatic woman named Kanna would appear in Brooklyn at NXT TakeOver: Brooklyn in 2015. Soon after she would rename herself Asuka and take the NXT Women’s division by storm, laying waste to the competition. Asuka’s ascension to dominance began late last year and hasn’t slowed down a bit. She’s faced the bratty yet nasty pairing of Emma and Dana in a series of matches before making her way up the women’s division’s ladder. Her impressive performance would speak for itself time and again, with ever effective body language relaying an air of mystery and playfulness. Then she would rip through local competition before setting her eyes on the championship. Bayley was in for her toughest battle after successfully defending the NXT Women’s championship against all comers. Bayley held the title with pride and years of fierce battles and constantly being underestimated finally came to fruition when she won in Brooklyn last year. But her reign would end after passing to the Asuka lock. After dethroning beloved underdog Bayley in Dallas, Asuka has taken on every challenger with an air of superiority and the crowd firmly behind her. She would face heat magnet Eva Marie immediately after winning the title, sending her packing out of the brand. Wave after wave of women looking to make a name for themselves would come after Asuka. She’d best them every time. Nia Jax would be the first big challenge to her reign. An unstoppable force would meet an immovable object and Asuka would prevail again. Soon after, Bayley would try to reclaim her former glory in a rematch. Asuka would send the hugster a brutal message in the form of pummeling Aliyah into submission. The Empress of Tomorrow would further become the most deadly member of the main roster. She’d go on to TakeOver Brooklyn II and defeat Bayley again in a rematch for the NXT Women’s Championship. Bayley would take the fight to Asuka but she was no match for Asuka’s stiff, decimating, hits. After conquering Bayley again in the Huglord’s final NXT match, Liv Morgan would call her out. Inspired by Bayley’s rise, Liv would try and recreate a Cinderella story. She would only last 60 seconds though. More women would come forward trying to knock Asuka off her pedestal but they’d continue to crumble. William Regal then brought in the big guns by having legendary former Women’s and Diva’s Champion Mickie James compete against her. The match would be a thing of beauty but the acclaimed legend would fall victim to Asuka’s overwhelming submission skills. Asuka’s cocky attitude would continue to grow along with her stranglehold on the championship. Her unflappable, skilled, and lethal reputation certainly proceeds her as she sits on the throne at the top. Nobody is ready for Asuka and she’s right, she’s knocked down her foes like dominoes every time. Her status of being the best has been sealed as she recently became the longest tenured NXT Women’s Champion. That accomplishment cements her as the final boss in NXT.